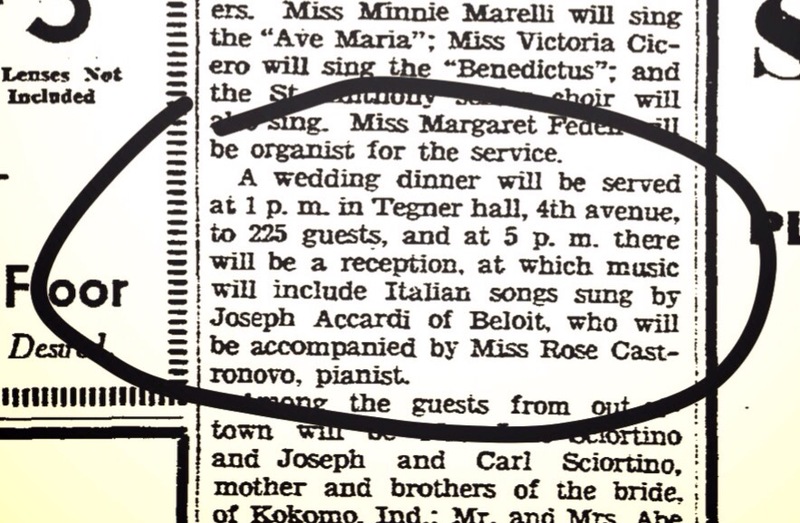 My Grandfather was a wedding singer. No, not a wedding singer like Adam Sandler in that movie of the same name. Grandpa would sing purely for the love of it. I doubt that he was ever paid to perform. 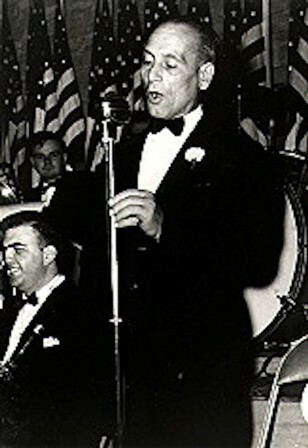 Giuseppe Accardi Americanized his name to “Joe” after he landed a foundry job upon immigrating from Marsala, Sicily to Beloit, Wisconsin in 1921. Unfortunately, he died in 1956 when I was only five years old. I don’t recall ever hearing Grandpa sing publicly. If you’ve attended a traditional Sicilian wedding reception, you know it’s an extraordinarily joyous celebration involving ritual, food, wine, music and dancing. The food is homemade. The “sweet table” is nothing short of phenomenal. Sometimes the wine is homemade too. The dancing is contagious. Most importantly, the music is performed live by a band whose instruments might include an accordion, a clarinet, a guitar and a drummer. I recall a clarinetist who appeared to have one glass eye that never moved with his other one. I recognized him at a number of wedding receptions when I was a kid. Fast forward fifty years. 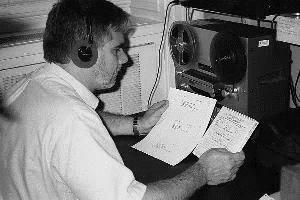 The Janesville Public Library board president heard a radio broadcast in the fall of 1985. Sima arrived unannounced at the library director’s office door to question me about it. Surprised, I stood to greet her. “Joe, did you ever make a record of Italian songs?” she asked without warning. Thinking on my feet, I deftly answered, “Huh?” She ignored my response and described listening to Joe Accardi of Beloit, Wisconsin singing “delightful” Italian songs on a Wisconsin Public Radio program called Simply Folk. Understandably baffled, I phoned the Madison station after our brief exchange and spoke with producer Judy Woodward. She read a description to me that accompanied the recording. Well, that could only have been my grandfather! The song, Luna Mezzo Mare, was selected from a collection of forty-year-old 78rpm shellac discs housed at the University of Wisconsin Mills Music Library in Madison. Further conversation with Judy, and later with my Dad, revealed that on a warm summer’s day in 1946 Grandpa was invited to record seven Italian songs for the Wisconsin Folk Music Project, a federally-funded program initiated in 1939 to preserve America’s ethnic folk music. Excited to learn I was the grandson of singer Joe Accardi, Judy mailed me a cassette copy of all seven songs. Eventually acquiring technology to transfer the songs from cassette to CD, I duplicated and shared them with other family members. The original 78rpm recordings remain housed both in Washington, DC and in Madison. In 1998, Sylvia and I traveled to DC for the American Library Association Conference where we took advantage of some free time to visit the Library of Congress. There we heard all seven songs while seated at a private listening station. Contents of the shellac discs had been transferred to a seven-inch tape reel which was carefully mounted on a deck for playback through headphones. 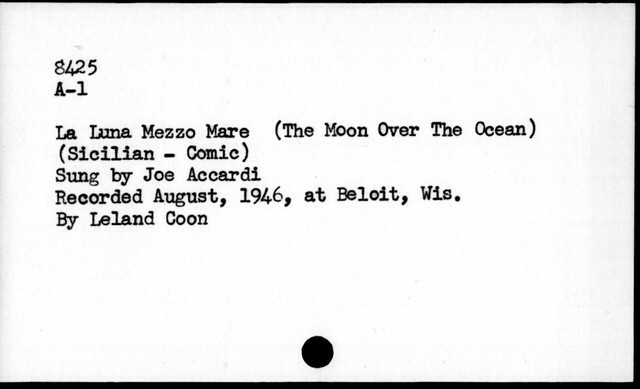 The catalog card reproduction shown above is still filed with several others bearing Grandpa Accardi’s name and song information in the Library of Congress. Joe, what a treasure you have here!!!! I so enjoyed hearing your Grandpa’s actual voice….just beautiful! He’d really be proud of you! I loved the story and the singing! Thank you.